Alameda, CA has a little old place called the Forbidden Island. It’s a well known tiki lounge right in the heart of the historical Bay Station shopping district. It’s quite the retro oasis and has been a staple in Alameda since April of 2006. Many compare the dreamy decor to the Enchanted Tiki Room in Disneyland from the glowing puffer fish to the tiki statues and Tahitian velvet paintings. 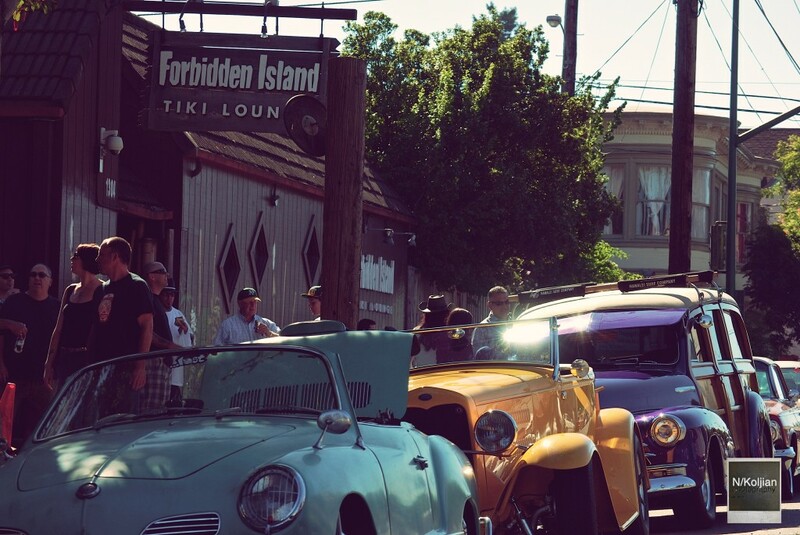 The Forbidden Island also is well known for serving up award winning, world famous and classic exotic cocktails and for the past 5 years serving up a little diddy known as The Tiki Car Hop. 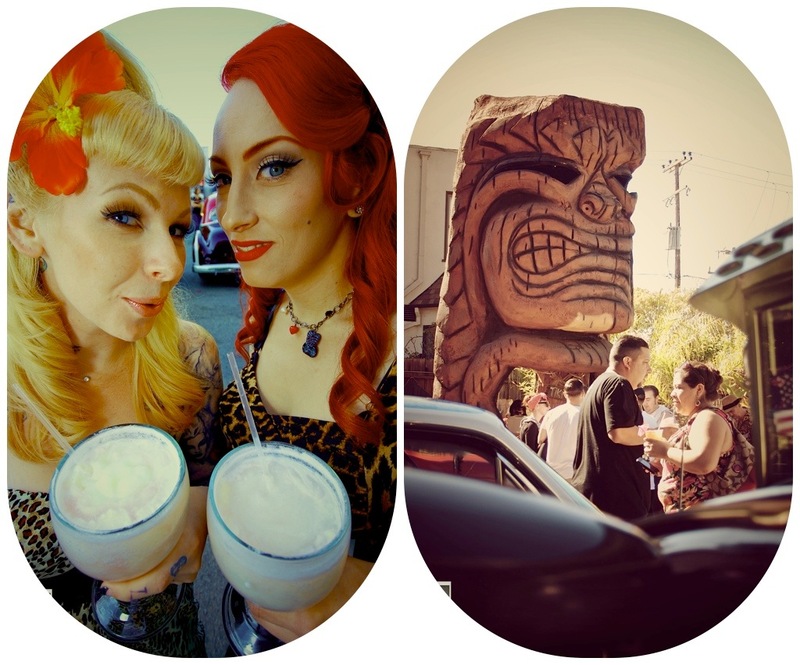 So let the gang from MyRideisMe.com take you on a little Polynesian treat where tiki island tradition meets mainland hot rod culture. 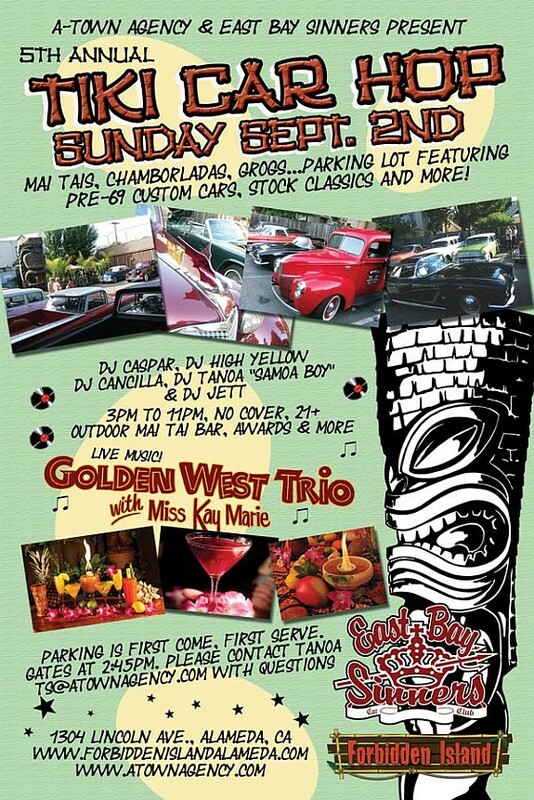 Grab yourself a scorpion bowl, relax and enjoy East Bay Sinners CC Tiki Car Hop @ The Forbidden Island in Alameda, CA. This being my first trip to the car hop, I didn’t know what to expect. Outside the Forbidden Island vintage rides lined the street. 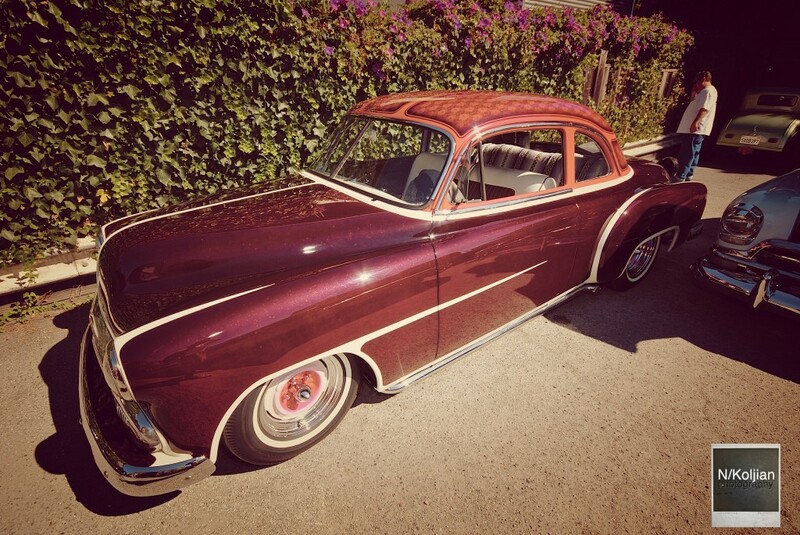 You had a 1950s Desoto backed up to a sweet red mid 50s drop top T-Bird. Along with that, a custom purple paneled Woody, a yellow 1932 Ford roadster and a vintage, pale green convertible 1964 Karmann Ghia. Right up the street was a line of old Metropolitans with a sweet little green and black 5 window Ford pickup. 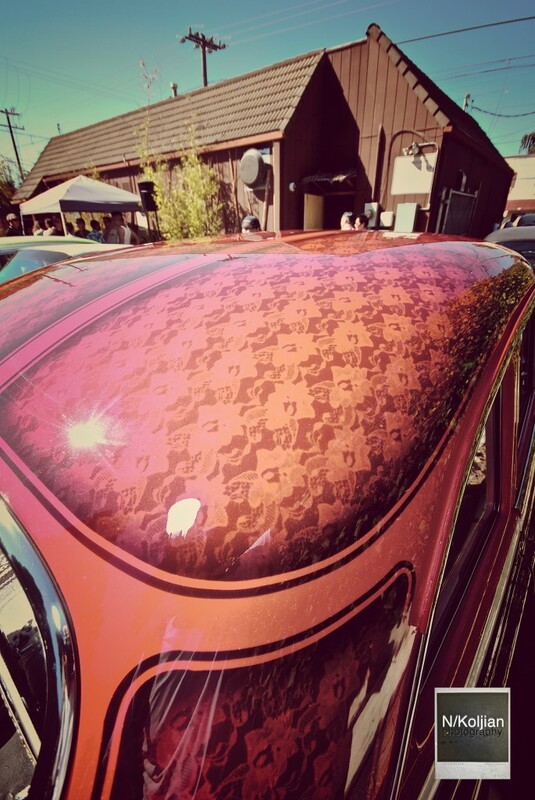 It was a really cool introduction to this year’s tiki rod hop. Once inside, you walk through the Polynesian paradise… Grab yourself a Tahitian treat and head out to the courtyard surrounded by a bamboo fence where a list of DJs spun groovy sounds. You exit the small court yard into the back parking lot where you’re met by a 30 foot tiki outside the mai tai bar. Strategically placed rods were around the gigantic tiki. In the court yard, there was some classic Caddys and choice 59′ 4 door Bel Air. The Windsor Deluxe blew my mind how clean it was and the 52 shoebox with some spectacular paint was just as amazing. Now as I walked around, I noticed this was really not a show but a gathering. What I mean by that, there was only about a dozen or more rides in the back parking lot. Now for the record, the back was not very big and if it were bigger, I’m certain there would be more customs. I took a minute and looked around and thought, “This is a cocktail party with hot rods.” How cool is that!? For the first time in a long time covering shows for MyRideisMe.com I slowly, gently released my normally firm grip on my trusty Nikon, strolled up to the mai tai bar and grabbed an ice cold cocktail. Time to have some fun! This wasn’t an actual show, by show standards, but this was going to be a relaxing good time. Fun was had from top to bottom. If you’ll kindly notice, I also went as far as editing my pics in a vintage style with tiki feel with soft colors and nostalgic perspective. I finished my cocktail and noticed there was a few more rides pulling up outside so I took advantage of the time. Close to sun down, the lighting’s perfect… I grabbed Hayley Mentz and snapped off some stellar pinup shots. Not only did I get to shoot with Hayley, I also grabbed a few with Hailey Lerren and pinstriping genius Trisha Turner. Special thanks to Rafael Jimenez for letting me shoot Hayley with his wicked 1953 Desoto Firedome. After a very nice, relaxing evening we decided to grab some pizza and sit on the curb and grub down. If you were there, let us know! Very cool story & pics on this event. Sounds like one I’d love to attend! I was there and I’m also a member of the East bay Sinners CC. ON behalf of my club I’d like to thank everyone who came out and had a drink with us. It was a blast, see ya next year!! As someone who has spent the last 8 years in Arizona and finally made it back to Nor Cal, I’ve been thrilled to discover these very cool little spots…as well as the extremely cool people who frequent them (Tanoa comes to mind). 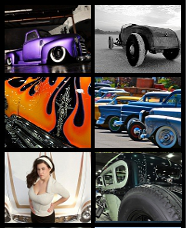 I’ve been working with Craig (MyRideIsMe.com) for several years, and it was always cool to see the rockabilly festivals and rod shows we attended in Arizona and Nevada popping up on the site. It’s even cooler to see us covering the Bay Area events so well, especially after attending them in person. The photographers do an outstanding job of capturing the true vibe that’s going on out here. Keep it up! We love it!